Schedule Your Runs. Your Way. Download the app for Free from the link. Companies and Drivers also have an option to directly register by clicking the button below. EZLinQ is designed to simplify managing your trucking business and scale up driver capacity when needed without hiring. The app also helps drivers to supplement their driving hours when they are available, which means no unnecessary down-time. Manage your trucking business from one Simple Platform! 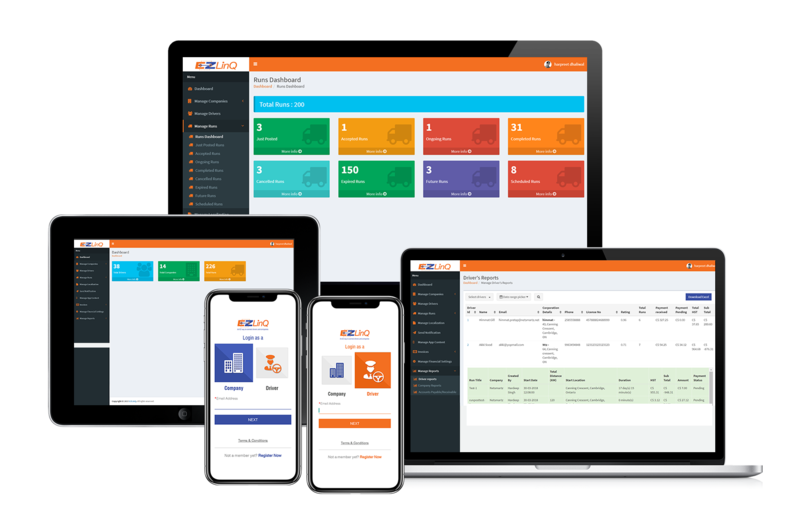 EZLinQ is the most efficient and affordable way to manage your dispatch, schedule and plan runs, track driver location, mileage tracking, instant payments, and much more. Drivers now have the choice of runs, rates and working hours based on their own personalized user settings. Avoid unnecessary downtime and maximize your driving hours by registering with the app today. Manage when, how and for who you work with absolute hassle free payments! EZLinQ is embedded with intuitive features to manage all your fleet details in an organized and accessible way. You can plan your dispatch, manage your company's permanent drivers, check driver ratings and availability, select payment rates, track driver's location and chat with them on the move and much more. Get to know more about all the other hands on experiences. Come visit our blog today! Have a question, suggestion or need support? We would be glad to assist you. Please refer to our Frequently Asked Questions section page for any queries you may have. If your question is not listed, please do not hesitate to contact us!